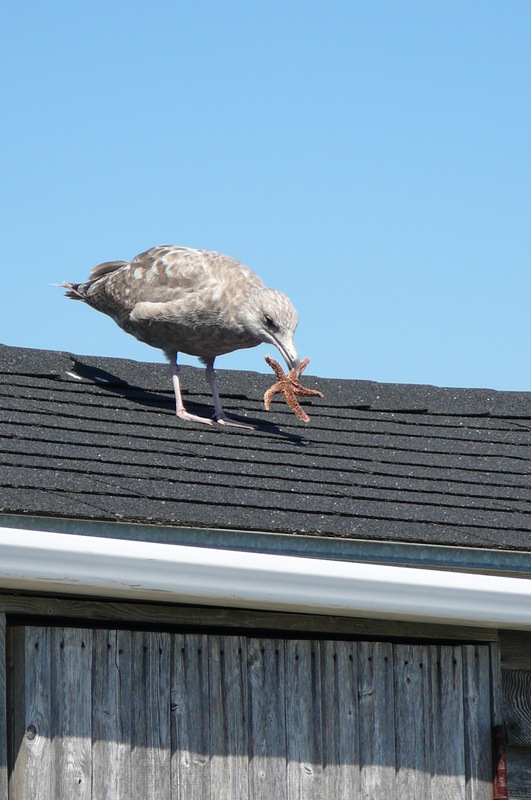 At present I’m working on a papier mâché seagull with a starfish in his mouth based on a picture I took a few years back when on a visit to Halifax, NS. Hopefully it will be completed in time for an art show at Place des Arts in September. 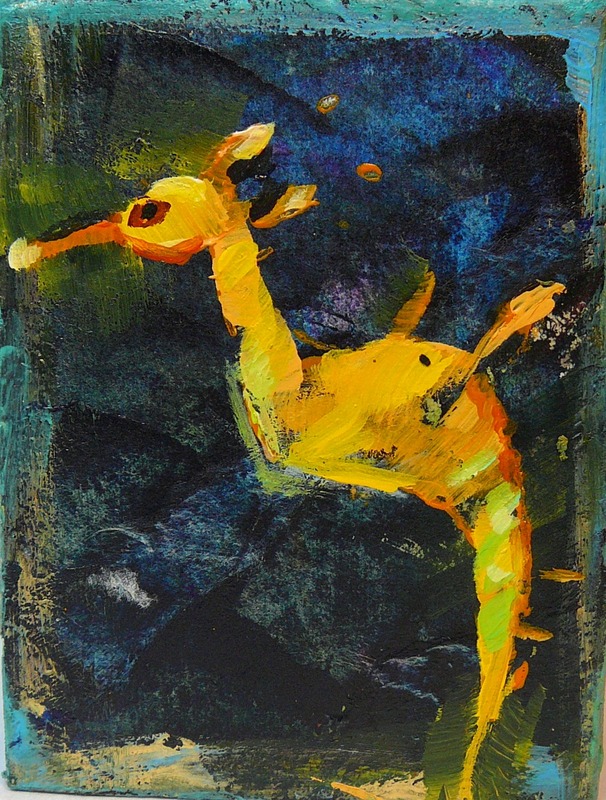 An acrylic painting is to go with the piece as well. 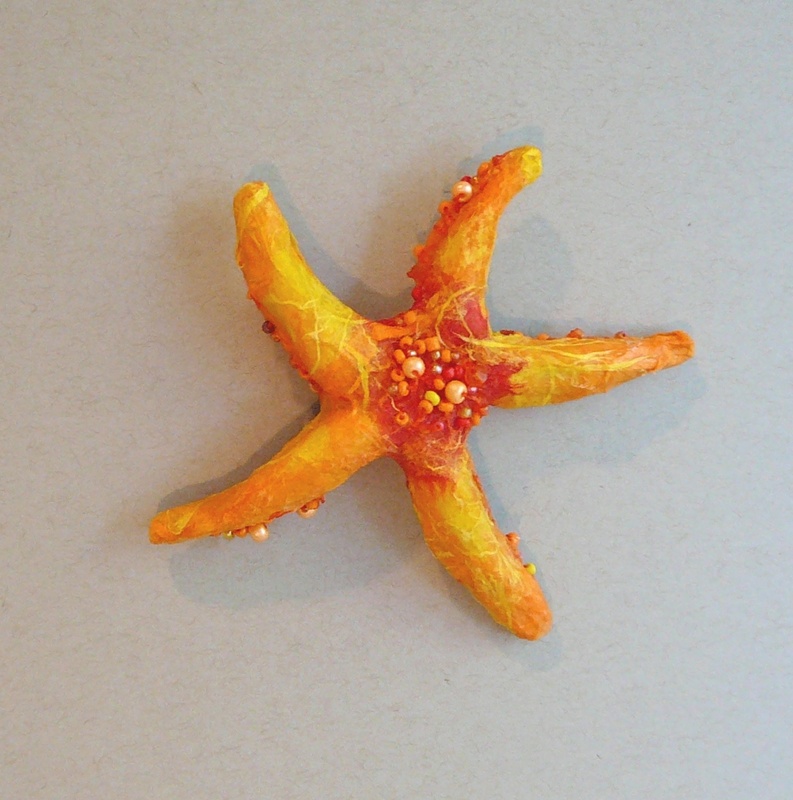 The seagull is a challenge but the starfish (which is the size of my palm) turned out very well. 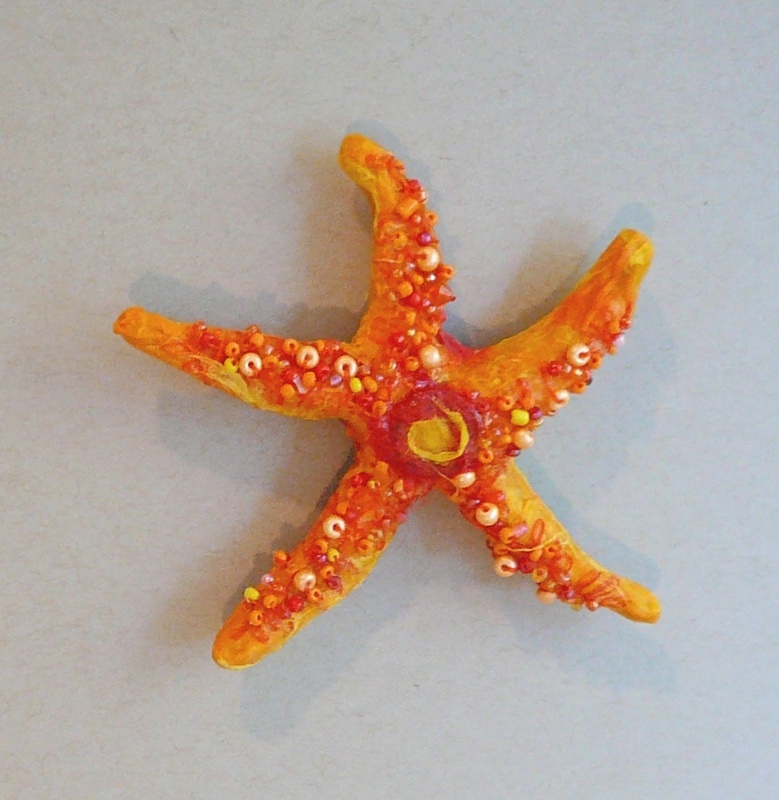 Below are pictures of the front (more beads) and the back (less beads) of the starfish as well as one of my original photographs that I am working from. Creating the hummingbird a few weeks ago led to me trying my hand at another wee bird creature (under 5″ in any direction). 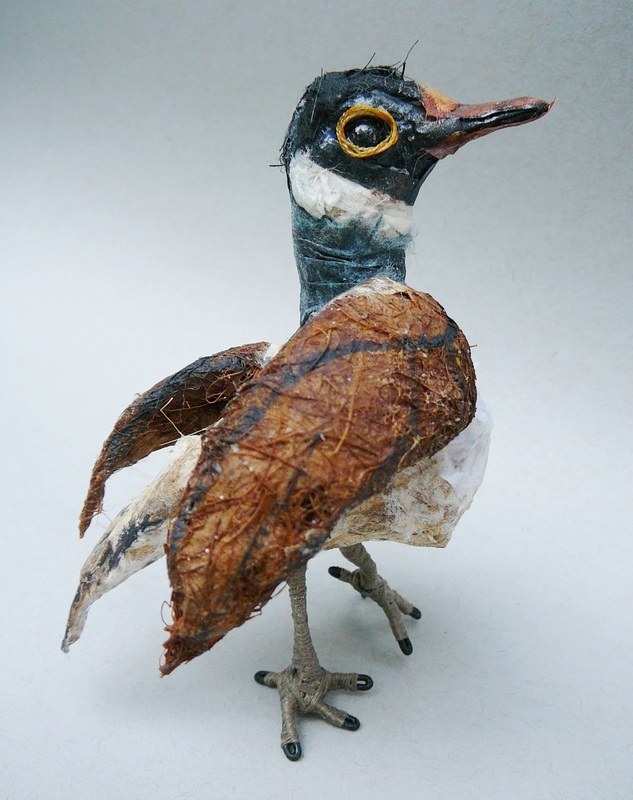 I was originally thinking of making a road runner but it ended up looking like a bird closer to home; the Canada Goose. Some of the artistic hurdles solved in this bird included how to make longer, animated legs and getting a rounded look on the wings. Kozo paper worked beautifully for the outer feathers. Over the next few weeks I will take a break from creating in the studio and look forward to spending more time outside; painting ‘en plein air’ and visiting the A Rocha Environmental Centre to take pictures and gather ideas to take back to the studio. Hummingbirds are one of my latest forays into seeing what else I can create with my unique wire and wrap mixed media techniques. 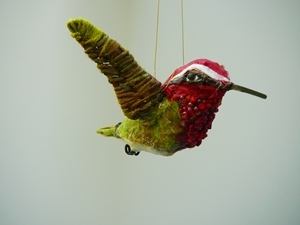 First it was dolls, then dragonflies, seahorses, and now birds starting with a hummingbird. There have been lots of lovely challenges to overcome (life size of 4″ being one) and a few more to come before I’m done. Hummingbirds are especially dear to me (as to many) and I remember vividly my first delightful encounter with a hummingbird when sitting in a garden at the age of 5 or 6. They are also seen in some circles to be a symbol for joy which is serendipitous with my name. 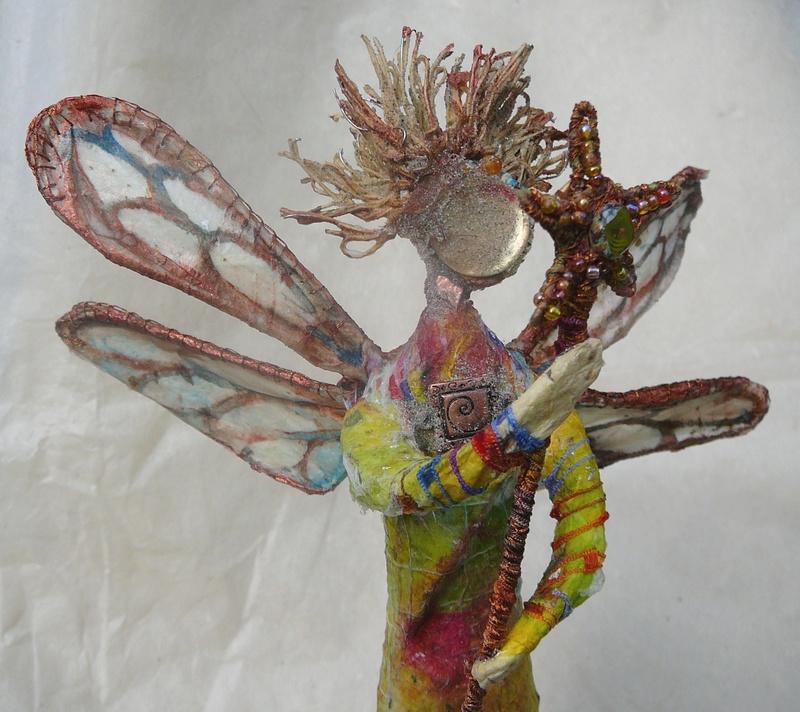 I have two workshops on creating a figure in papier mâché coming up soon, one at Place des Arts in Coquitlam, BC (Dec. 1 and 2, 2012) and one at Coast Collective near Victoria, BC (Nov. 16, 2012) on Vancouver Island. 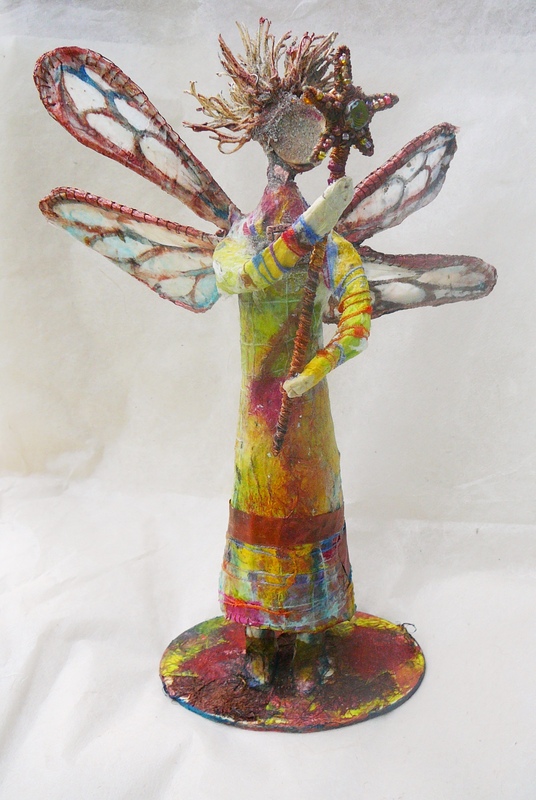 On the weekend I had a chance to create a new angel and, no surprise to me, she turned out very earthy and bearing dragonfly wings. Years ago I was working on an earth angel series and it feels as if the theme has returned. I always enjoy when I cycle back into a place I’ve been before but with more depth and insight to make the process richer each time round. Here is the description for the workshop and for more information on the workshops them selves click on Place des Arts or Coast Collective on my blog roll for more information and to register for a class. 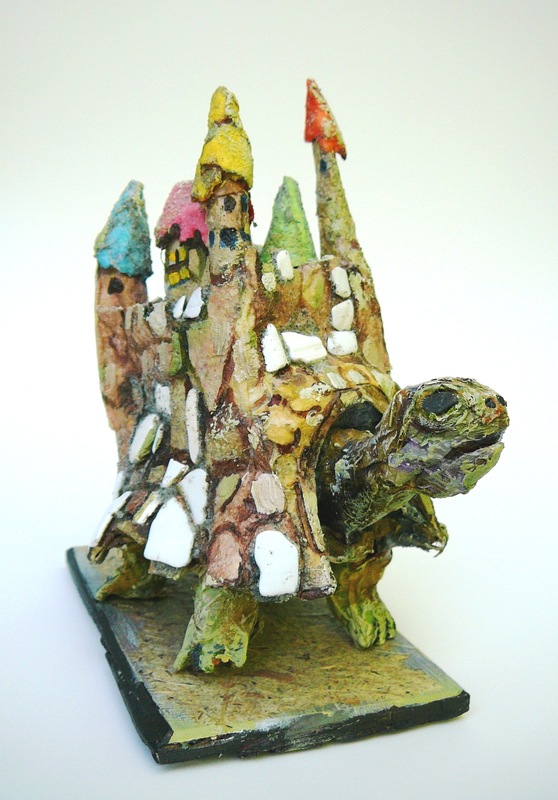 This papier mâchè tortoise stands about 6″ high was created two years ago for the Place des Arts annual Positively Petite show. What’s his story? Is he looking for others with castles on their backs; maybe a tortoise RV park in a sunny climate? Or does he need little people to inhabit his castle; rather like a Gulliver in search of Lilliputians. He’s on a quest, that I know and his pondering, wandering stance seems to bring out the storyteller in me as I wonder what his story is. It’s a busy time in the Kirkwood studio. Preparing for upcoming Spring classes mean creating prototypes and updating previous ideas. 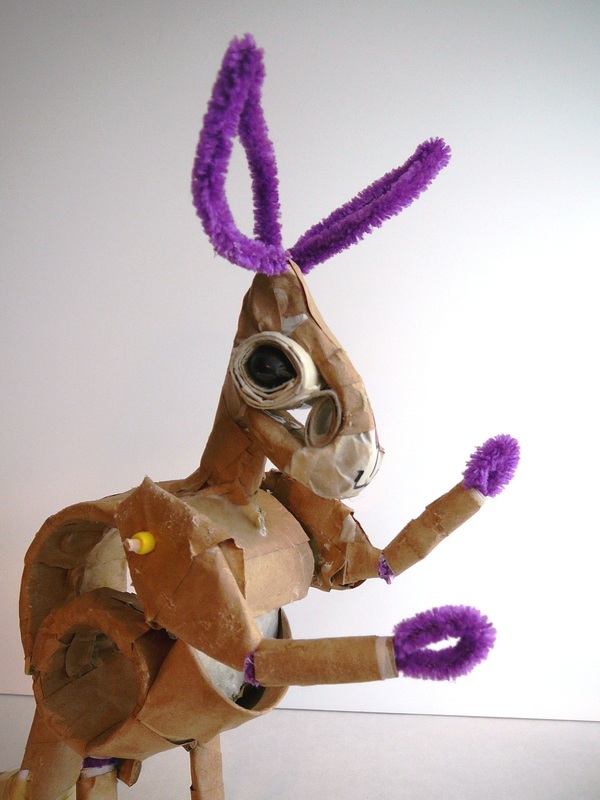 One class I’ve tried to run twice and am attempting for the third time is a papier-mâché creature shop class where children 8-12 would have a chance to design and produce their own creature with movable parts. 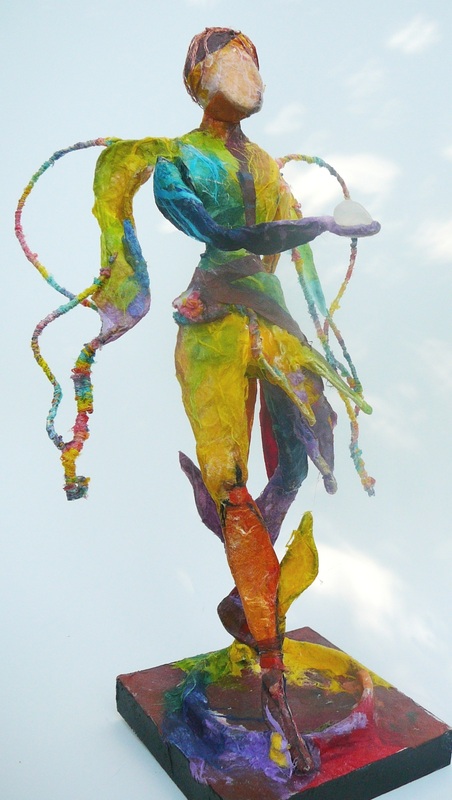 The results could be quite sculptural, or like a rod puppet, be more mobile and animated. 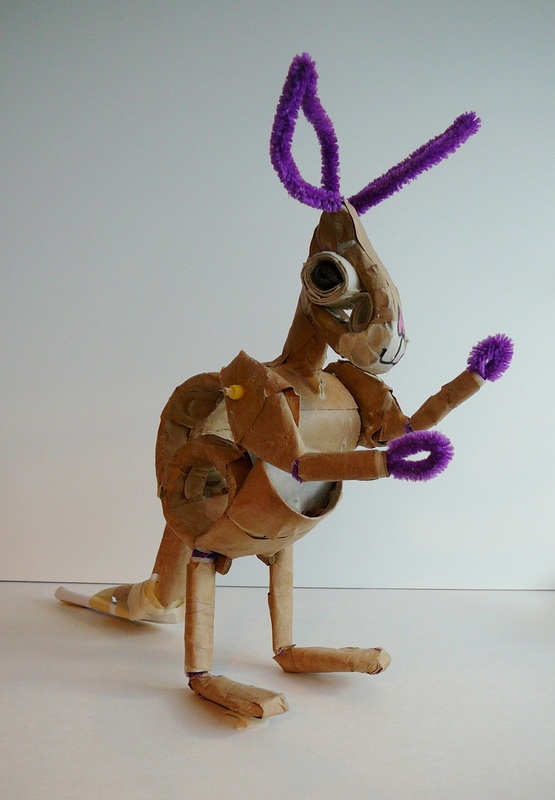 With this criterion in mind I created a new creature for the display case at Place des Arts where the children could see the structure underneath such a project. Originally begun as a rabbit he morphed into a kangaroo(ish) and seems quite proud with how he’s coming along. The class numbers went from one to three in his first week in the case which is promising. Two weeks to go and I have my fingers crossed that we can meet my 6 student minimum to run the class. Click on the blogroll Place des Arts button for more information on this class or others by Joy and to register.